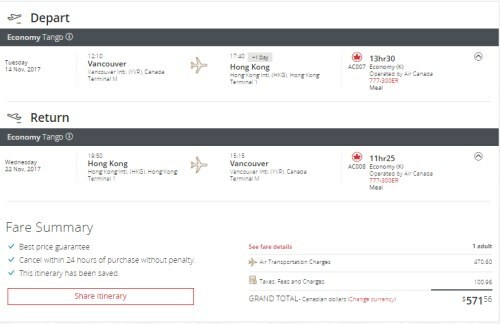 Air Canada has dropped the price of their non-stop flights from Vancouver to Hong Kong down to $576 CAD roundtrip including taxes. They are also available from Victoria (YYJ) for the same price (1 stop in Vancouver each way). Click on the departure date box to open up the calendar view and browse for cheap date combinations. Look for the flights that are $620 CAD roundtrip. 3. On FlightHub, they are showing up as a 'Phone Only' deal. Click on 'Select' beside the deal, and it will show the phone number to call (1-800-755-4580). You can also fly from Vancouver to Hong Kong, and then fly home from Shanghai, China to Vancouver - for just $493 CAD roundtrip including taxes. The flights are non-stop both ways. Use the same roundtrip dates you found on Google Flights above. Or you can fly from Vancouver to Hong Kong, and then Beijing, China to Vancouver - for a total price of $535 CAD roundtrip including taxes. These flights are also non-stop both ways. Returning from Kaohsiung, Taiwan is also possible, for a total price of $560 CAD roundtrip. However, the flight home from Kaohsiung does have a layover in Tokyo, Japan. Update 5/29 - The non-stop flights with Air Canada from Vancouver to Hong Kong are back again today for $584 CAD roundtrip including taxes. There are a wide variety of dates available between September 2017 and all the way through to April 2018. Click on the departure date box to open up the calendar view and browse for cheap date combinations. Look for the flights that are $619 CAD roundtrip. Update 7/5 - These have returned today. 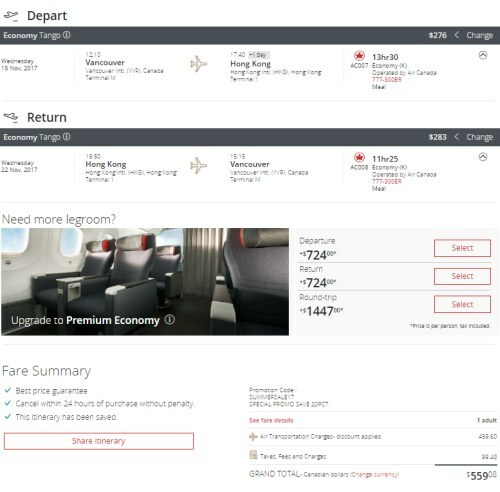 Non-stop flights from Vancouver to Hong Kong with Air Canada can be found for $572 CAD roundtrip including taxes in November 2017, and in January/February 2018..
Look for the flights that are $572 CAD roundtrip. 2. Click through to the Air Canada website. 1. Go to the Air Canada promo code page. The promo code is SUMMERSALE17 but if you go to the link above, it will be automatically entered for you. The promo code expires on August 13, 2017. 2. Try searching for a flight from Vancouver to Hong Kong (HKG). Try departure dates in September, October, November, or early December 2017. Or try departure dates in January and February 2018.
vancouver, yvr, flight deals, air canada, taiwan, asia, east asia, beijing, china, pek, shanghai, pvg, hong kong, hkg, kaohsiung and khh. 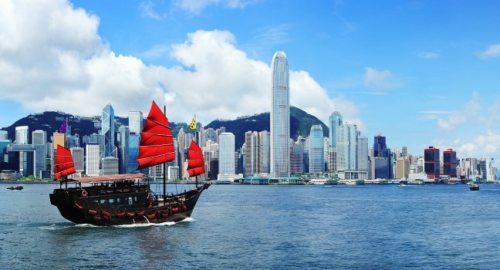 5 Responses to "Vancouver to Hong Kong - $559 to $576 CAD roundtrip including taxes | non-stop flights, same price from Victoria. Return from Shanghai or Beijing, China for even less"
Oops - nevermind! I just saw that is the price. Thanks! Nope! It doesn't have to be 2 weeks. Any date combination you find on Google Flights for $620 should work. FlightHub should show the same dates for $576. Again, Air Canada just refunded the ticket, didn't informed me.